In everyday life, the human being walks in a natural opposition, very slightly turned out and with his weight somewhat forwards towards the ball of the foot. Whether walking, skipping, running or jumping, everyday life calls for no more turnout, nor even for more balance. Nor do we, in everyday life, have any great need to suddenly dart sideways or backwards! Compared to the untold-of possibilities for movement that the turnout affords, the parallel stance is extremely restricted and not only on the physical plane. The moment we wish to go beyond our immediate circle, and amplify even the simplest of gestures for expressive purposes, the actor, the opera singer and the dancer all find that the bodyweight must shift back and be placed squarely over the hips. And so we find ourselves standing more upright, while the legs and feet turn out, to help the body balance. The sequence is thus first, bring the body back to its axis, and second, turn out. Erroneously referred to as positions of the feet, the five positions of the body are the visible manifestations of a dynamic that the turnout alone can unleash. Never could these positions, and this dynamic, occur in a stance with parallel feet. To each of the turned-out five body-positions corresponds a potential: the first and second correspond to upwards movement and to forms of rotational action, while the third, fourth and fifth correspond to a larger family of rotational action and to upwards combined with sideways, forwards or backwards movement. The turned out fifth position, known only to Western classical dancing, allows dancer, to release the full power of the oppositions for the purpose of great virtuosity. At the Maryinskii Theatre School at the end of the 19th Century, where many of the greatest dancers of all time were trained, the selection criteria that we apply today – based essentially on hyper-mobility and an extreme natural facility for turnout - did not exist. Thus, once those students, by then professionals, reached Enrico Cecchetti’s Class of Perfection, he would most certainly not have been working with what we would now call perfect bodies. How, then, were they able to execute Cecchetti’s classwork, much of which is of transcendental difficulty? In attempting to answer this, one should perhaps observe that since Cecchetti himself devotes but a few lines to turnout in his famed Manual, he must have seen it as the necessary and inevitable outcome of a dynamic, rather than a thing in itself. We may therefore wish to consider a notion fundamental to Cecchetti, that of Aplomb, as it relates to turnout. As I understand the progression of principles in Cecchetti’s Days of the week, the Monday School (Les Assemblés) can be seen as a study of aplomb. This concerns finding one’s centre, the centre of gravity, returning to it, and stabilising oneself in movement. It is important to see that the body moves first, activating the postural muscles. It is these muscles that are designed to support the body, freeing the leg muscles simply for the action of the dance. Once we have brought our weight back over the hips, and turned our legs out naturally, we need to create our positions. We begin by engaging the muscles in the torso in order that the body continue to move upwards and away from the legs, allowing the space for more turnout in the hips. Consequently, the more one wishes to turn out, the more one draws upwards and away from the hips. At the barre, stand in an easy first position. Concentrate on perceiving the line of verticality running straight down the centre of the body down through to the floor. Engage the backs of the legs, lift the lower belly, drop the tailbone, all the while feeling the upwards pull of verticality. Down on the floor, like the roots of a tree the weight spreads out through the feet from the heels. At no point may the weight be allowed to shift forwards to the ball of the feet. Without losing that thread of verticality, and while holding onto the barre, take a battement tendu à la seconde. Does one feel that dynamic thrust upwards? Or is one sinking onto the standing leg? Then close back into first position. Open to battement tendu à la seconde again, this time shifting the weight of the body slightly towards the barre and onto the ball of the supporting foot. In the latter case, the dancer will generally note a loss of that upwards thrust, as his weight settles down into a leg forced to do the work that the body is designed to do. It is only when one takes the battement tendu without allowing any shift in weight onto the supporting leg, that one will perceive how the spiral arrangements of the musculature, as it turns outwards, operate from the top downwards. A first spiral works its way through the back, from outside the edge of the shoulder-blades, proceeding down the full width of the back through the centre. A second spiral springs into operation as the dancer pushes his heel into the floor on the outwards journey of the gesture leg: down the back of the gesture leg, spiralling round like a candy-cane ribbon to emerge at the front of the knee, down around the outside of the calf to envelop the outside of the ankle, and re-emerge at the front of the heel and out over the big toe. Thus the position termed à la seconde is not actually a flat, face-on alignment, but becomes a three-dimensional arrangement of a body position (volumetric as opposed to plane geometry). Properly understood therefore, in the Cecchetti Method the dancer will find himself standing in the body, rather than on the supporting leg. Furthermore, once the dancer has learnt to stand in relation to the line of aplomb, both sides of the body will be activated at all times. If, however, the dancer allows his weight to shift towards the ball of the foot, the barre-side will tend to be inert, and on leaving the barre, that inertia will tend to persist. In his efforts to hold the turnout in action and without the barre’s support, he will likely apply unnecessary force down through the leg, obstructing movement and eventually, acquiring hypertrophied muscles. From the Head, on down! Rotation does not occur in the hip-joint alone: the impulsion, surprising as that may seem, comes from the eyes and head. The turnout – and the very word means turning outwards – is the manifestation of an outwards-looking and positive attitude towards the world. That is what Cecchetti means by « the head (…) slightly raised with the features animated and expressive ». Therefore, the eyeline is raised just slightly over the horizon, or, in theatrical terms, stalls circle, or first balcony. The head is held as though floating, and without strain, on a long neck and quite perpendicular on top of the shoulders, themselves squarely over the hips. The shoulders must never be allowed to curve inwards nor should they be forced backwards. As we are beginning to see, for Cecchetti, turnout is not about feet or positions. It has to do with the notion of « standing up straight », or in his own words from The Manual, « keep your body poised, erect and perpendicular on your legs, except in attitudes and arabesques …. ». Once the body is held perpendicular over its axis, the turnout is a process of work around that axis. In Cecchetti’s work, the first three physical principles, as I see them, are structural: aplomb, opposition (épaulement) and turnout. From these, flow the three principles that pertain to movement through space: weight transfer (the family of jetés), the aerial plane (pointework and batterie), and dynamic use of space (grand allegro, grand fouetté sauté). How do we sustain the line of aplomb in movement? Well, in everyday life one walks down the road, swinging one’s arms in gentle opposition to the rhythm of the stride. Opposition, being inherent to the human being, requires no injecting of energy. In the turned-out classical dancer, the gesture leg, as it opens, has a dynamic thrust. According to natural law, for every action there is an equal and opposing action. In the instance of the battement tendu, the initial force is exerted DOWN the back of the body as the heel of the working leg thrusts dynamically into the floor and AWAY from the 5th position. In order for this dynamic thrust to fulfil its potential it must maintain its stability, and this is achieved by another force, UP the front of the body, lifting it off the hips, TOWARDS the harmonic centre, the heart, and continuing upwards and onwards to alight in the head, the centre of balance. ’Down and away and up and towards’, these dynamic forces actually help the classical dancer who is constantly striving towards perfect stability, harmony and balance. 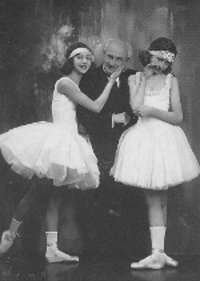 Why does Cecchetti use the term “classical theatrical dancing”? Theatrical dancing, singing and acting developed to be seen in a public place: the theatre. There, highly trained human beings carry others into otherwise-inaccessible realms. Particularly in the case of the classically-trained dancer, the raison d’être of the turnout is to express through the body, ideas and emotions that the untrained human being aspires to commune with. By turning out, the dancer allows processes that occur within the heart and mind to amplify and thus radiate outwards, embracing, as it were, the world.